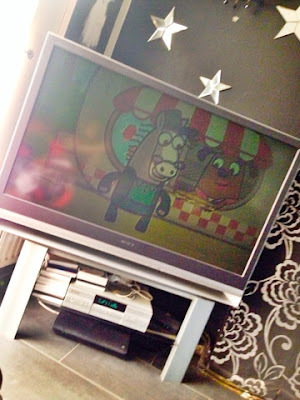 CBeebies is the only kids TV channel that gets watched in our house and Boj, without a shadow of a doubt, is C's favourite programme. I remember seeing the adverts for it only beginning in around April/May last year and we eagerly waited on it being shown for the first time. We instantly loved it and it became a firm favourite in our house. Every time the theme song comes on, C stops what he's doing to watch. It's not only the kids who love it, Chris and I do too. I defy anyone to listen to the theme tune and not feel happy afterwards! Boj the bilby and his adventures in Giggly Park with Mimi, Pops, Denzil, Gavin, Mia and the rest of the gang have reined in half a million views in just over a year of being on air. 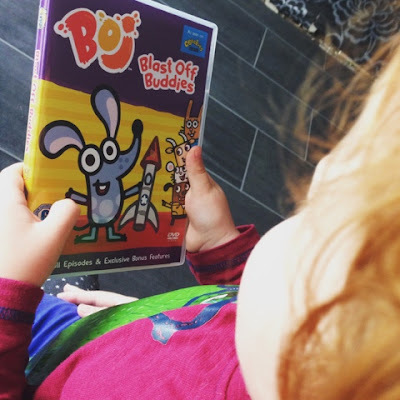 If you're not a CBeebies watcher, you can now watch the adventures whenever you want thanks to the release of Boj's first DVD - Blast Off Buddies. C is a very lucky boy and he has recently had the opportunity to give the DVD a watch. When it first arrived, he was so happy and excited and shouted, "BOJ!". We popped it on and you can choose to watch in English or French which I thought was great if you are a bilingual household. C tried his hardest to sing along - it's the cutest thing! The DVD has ten 11-minute long episodes including the episode 'Blast Off Buddies' taken from the DVD title where Boj tried to fix his friend Gavin's rocket and blast it to the moon. The premise of the show is that Boj, alongside his parents Mimi and Pops (voiced by Jason Donovan of Neighbours fame!) and they live in an underground burrow. We also see a whole host of other characters such as Boj's friends Denzil Woof and his parents Mrs and Dr Woof, Gavin Bleat and his parents Mr and Mrs Bleat, Mia Twitch, her parents Mr and Mrs Bleat and her brothers The Twitchlets, Rupa Nibblit and her parents Mr and Mrs Nibblit and finally Mr Cloppity who is the keeper of Giggly Park. Each episode is so much fun and we see lots of messy fun and creativity. Boj always finds solutions to situations or dilemmas with his 'Boj-a-boom' ideas! I think that this teaches children a lot about how to fix things and think for themselves. The fact that the episodes are only 11 minutes long means that your child doesn't lose interest and can remember everything that's gone one in the one episode. C actually sat through all of them on first watch - he loves it that much! Alongside the episodes, listed in full below, you can also find the Boj theme tune karaoke video, The Duckling 'Home To Me' karaoke music video, Keeping Mr Cloppity 'Altogether Now' karaoke music video and even printable colouring in sheets of Boj, Denzil, Mia, Rupa and Gavin. Denzil accidentally breaks Gavin's new toy rocket so Boj comes up with an idea that will make the spacecraft fly. It's Rupa's birthday and Boj has a boj-a-boom idea to help Mia get her an amazing present. It's a hot day in Giggly Park and Denzil has invited some friends over to play. Boj gets a boj-a-boom idea how to mend the leaky paddling pool with Mrs Woof's extra sticky pancakes. Mrs Woof makes her big soup but is missing Me Cloppity's carrots because his crop has failed. Denzil, Gavin and Boj rescue the residents of Giggly Park from a variety of mishaps and create a game they can all play happily together. The friends want to bury their own time capsules but soon begin to miss the items they put inside them. Denzil has lost his treasured teddy bear, Snugsy. The Twitchlets have Snugsy but they won't give him back! How can Boj get him back to Denzil and keep the Twitchlets happy? All Boj's buddies have collections and Boj wants one too. But he loves everything in Giggly Park so much that he can't decide which things to collect. To keep birds away, Mr Cloppity hangs out yoghurt pots on strings over his seeds and Boj's friends are ill so can't come out to play. Boj, Rupa and Gavin are trekking for their Ranger survival badges. When Gavin's satnav boots go on the blink, Boj has an idea to get them back on track. 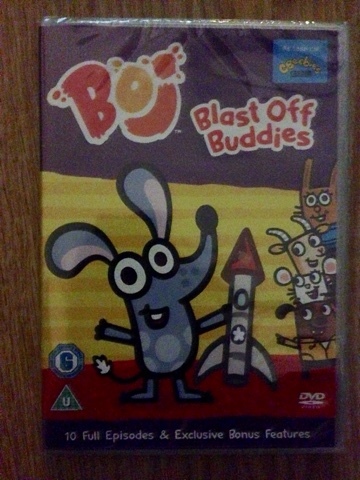 Blast Off Buddies is available now from Sainsbury's (RRP £4.99), ASDA (RRP £5.99) and Amazon (RRP £7.25). You can keep up to date with all things Boj at the website, Facebook and Twitter. The next DVD release, Giggly Holiday, will be released in July so keep an eye out for that too! I think I'll have to purchase it for C and E!